On the heels of the discussion and controversy around the recent film A DANGEROUS METHOD, here's your chance to dive into a rich dialogue about shadow and the complexities of relationships and theory at the dawn of the field of psychology. The year is 1910. Sigmund Freud and his heir-apparent, Carl Jung, are changing the way we think about human nature and the mind. Despite their passionate rivalry for Jung's mind and heart, the two women often find themselves allied. Born of aristocratic Swiss families, they are denied a university education, and long to establish themselves as analysts in their own right. Passionate and self-educated, they hunger for another intellectual woman with whom to explore the complexities of the soul, the role of women in society, and the archetypal feminine in the affairs of nations. Their relationship spans 40 years, from pre-World War I to the dawn of the Atomic Age. Their story follows the development of the field of psychology, and the moral and professional choices of some of its major players. Click here to read in in-depth book review of Out of the Shadows from the Journal of Analytical Psychology, June 2011. Sue Rosenthall's book review of Out of the Shadows, from the Journal of Analytical Psychology June, 2011. Good dramatic writing is an expression of empathy. The words must carry fellow feeling, inhabiting the various perspectives of individuals in conflict struggling to find a viable foothold in the tumultuous currents of their lives. 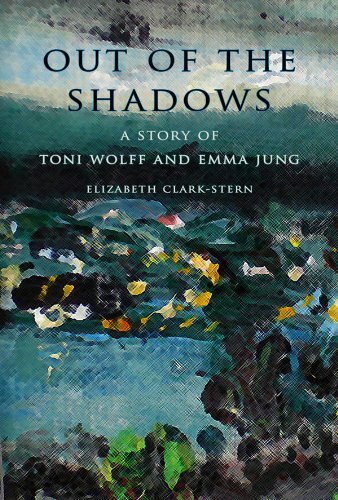 The play script, Out of the Shadows: A Story of Emma Jung and Toni Wolff, written by Elizabeth Clark-Stern, chronicles the experiences and relationship between two aristocratic Swiss women in the life of Dr. Carl Jung. Throughout forty, often wounding, years of interaction, Emma, Jung's wife, and Toni, his mistress, friend and analyst, suffered the pain of engagement in a triangulated relationship. Therapist and dramatist Clark-Stern offers us a fresh slant on this complex alliance, creating two women characters with strength and resilience, capable of insight, change and growth through the storm of their difficult liaison. Toni and Emma occupy centre stage and are the focus of the reader/viewer's attention in this two-person drama. They are cast, not as 'Jungian women', the constellation of acolytes who in the first half of the previous century surrounded and bolstered Jung, but as two complex individuals. In this story, the lens has been calibrated to a new setting, now offering the depth of field of an alternative, female perspective. We first enter the world of C.G. Jung, seemingly tranquil on the surface, set in a paradisiacal garden fronting Jung's residence on the lake at Küsnacht. It is the summer of 1910 and the playwright envisions Toni Wolff on her way to a therapy session with Jung. We meet Toni as Jung's wife might have experienced her at their first encounter: a fashionably dressed young Swiss woman, desperate and sullen, sent to Jung for analysis by her mother because of severe depression. The view has to be provisional. The story, it is important to remember, is a work of the imagination hung on the bones of research, given flesh and life by Clark-Stern, with sufficient artistic licence taken to make the story coherent and accessible. extended active imagination with the female characters in an intense dialogue with each other and the significant male figures in their lives over the span of decades. The reader can imagine hearing echoes of what might have been for Toni Wolff an unconscious enactment of a primary Oedipal triangle. Elizabeth Clark-Stern suggests that Toni, a father's daughter, is grieving the loss of this significant, ambivalent, male figure in her life. Her father, we learn, valued her intellect yet denied her a university education, and, after his death, consigned her to traditional female role expectations. Toni's transference to Jung could have been that he was the great man who would recognize her gifts, treat her as an intellectual peer, and educate her in his theories and methodology. This is, of course, conjecture, yet by presenting these two characters with such dimensionality, Clark-Stern opens the reader to projection and fantasy beyond the limits of what has previously been known about the women's complicated relationship. projection of Jung, and into a claiming of greater personhood. masculine aspects of her own female self. What is enacted in the second act of this drama are the essential stages of positive female development: moving beyond the negative animus, the culturally sanctioned, often devaluing, male attitude towards women, and toward claiming a solid feminine ground of being. Toni and Emma must come to the awareness of shadow carried by the other, that is, how each has to claim the projected parts of self to become whole. Emma must claim her own intellect and Toni her need to mother and generate. Both then can 'birth' potential in her own psyche: Toni by 'nurturing' analysts in training and Emma through her writing and teaching of classes. Clark-Stern's story of these two powerful women stands as a convincing narrative. Even without the advantage of viewing the play, the characters come to life for me, embodied, passionate and admirable. Her vision of the women adds essential dimension to both Toni and Emma and certainly to Jung. Wolff, T. (1956). Structural Forms of the Feminine Psyche. Trans. Paul Watzlawik (privately printed for the C.G, Jung Institute, Zurich.